Review of “Rebel Soul” by Kid Rock released on Nov. 19, 2012 | Errols Weekly Music Update. Mention the words- “Kid Rock”- and the reaction is swift- in one corner there are those who love him and others will tell you to go sit in a corner – akin to giving a child a “time out.” There is no in-between, right? The Kid has released his ninth album (yes you read it correctly, his ninth) and if one scours the internet or I-Tunes (is there anyone else wondering why this in’t a big story- try and find it on the internet, there is nothing about it), the reviews are split right down the middle: love and hate. I often wonder if much of the criticism leveled is directed at him personally and not towards the music he makes because in my opinion, if given a chance, his musicianship and vocals are actually credible. Are there “chorus driven” songs? Yes but ask Springsteen fans to not sing along for three hours and see the reaction you’d get. 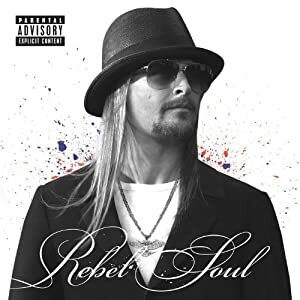 “Rebel Soul” is all about the Kid and in my opinion is his “break-out” album especially after doing his “Rubin”-controlled “Born Free” which tried to change what Kid Rock is all about. You can’t contain what for him comes naturally- rockin’ & rappin’- and making music that moves him. Oh yes- he wants you to join the party but even if no one showed up, he’d have his Twisted Brown Trucker band-mates and jam to the music that embodies his rebel soul. The title track has that Bob Seger feel to it and at first it really didn’t hit me but after a few turns it has grown on me to the point where I can picture being in a muscle car with the top down headed to the beach singing- “Rebel Soul.” I like the bridge where the tune takes a turn sort of like a piece of paper being blown up in the air by a strong burst of wind- the kid can sing- listen to this track and you’ll see (hear) what I’m talking about. The beginning guitar riffs for “God Save Rock and Roll” reminds me of the Kiss song- “Let me go, rock and roll.” The Kid is giving Kiss and AC/DC a run for their money in using the words “rock and roll” in his song titles. The tune starts off a bit slow but turns into a foot stomping, hand clapping country laced rock and roll fun time song but watch out for the “out of the blue” F-bomb towards the end. (While you are dancing head over to the kids and hold their ears). The middle of the album takes a slight turn as the songs become less memorable than the first half of the disc. “Happy New Year” is a song that almost made me hit the next button but again after a few turns it will grow on you. “Celebrate” is a good song with a catchy groove but you’ll wonder if you have heard it already. “The Mirror” in my opinion, is the least desirable song on the album-I’m not sure why Kid used the “auto-tune” to mask his vocals- it’s like this should have been used on his first few albums when people didn’t think he could sing. He can and this track takes a step backwards. Track 9- “Mr. Rock and Roll” will get you out of your seat and you’ll be “air-guitaring” and “air-piano-ing” in no time. The album ends on a strong note with the final four songs- “Cucci Galore” could be my second favorite song on the album- I know what you’re thinking- you like this song? No, I love it- the groove is so silky smooth and it has loud guitars- what’s not to like? I can’t get the chorus out of my head. The female singer on this track is “off the hook”- love it. But again- be aware of the big “F-bomb” and other curses- not for the faint of heart. The country rock comes flying right back with –“Redneck Paradise”- and I’ll just say one thing- I wish I could sing it like Mr. Rock- this is way too cool. You’ll feel like you are in a saloon ordering up a Jim Beam in no time. “Cocaine and Gin” could possibly be the best Kid Rock song he has recorded. I know what you are thinking- how could a song containing the words cocaine and gin be a good tune? If you give it a chance and let it sink in you’ll be amazed- this is a “wrap your arms around the ones you love” and sway back and forth and let the music take you away. Way to go Kid- this is a masterpiece in my opinion. The album ends on a high note with ‘Midnight Ferry’- I don’t want to get too crazy but this could be the second best song that Kid Rock has ever recorded. This is “old school” style with an addictive chorus that will have you clapping your hands with the beat and then clapping for applause when it ends- this song is awesome!!! “Rebel Soul” gets back to what Kid Rock is all about- you can’t contain him- you can’t box him in to one genre. I find it amazing that the critics want him to be what they want him to be. He likes all kind of music and pulls in these influences and turns into his own- what’s not to like? I like rock and roll, country, soul, rap and totally get where Kid Rock is coming from and believe me I am staying on this ride wherever it takes me. Put another quarter in the juke box and turn it up!! !